Eating at least five portions of fruit and vegetables a day is important in maintaining a healthy immune system and preventing you from developing diseases such as, cancer, diabetes and heart disease. Your five a day needn’t consist of five pieces of fresh vegetables or fruit. Eating dried or frozen fruit, and drinking smoothies and fruit juices all count, so you can vary your intake. Processed foods are to blame for a wide range of health problems including type 2 diabetes, obesity and heart disease. These foods contain high levels of saturated fats, salt and sugar. Fruit is delicious and nutritious, and can help prevent premature ageing, remove toxins from your body and boost your energy levels. What’s more, it’s fat-free, cholesterol-free, sodium-free and loaded with vitamins and minerals. Fruit not only improves concentration and alertness, but it can also improve our memories. It is not known exactly how this is possible, but initial studies have show that our brains recall information faster with a regular intake of fruit than without it. This means fruit can be beneficial for students sitting exams. Many healthy eating organisations recommend eating five portions of fruit or vegetables each day. Yet a portion isn’t necessarily equal to one fruit. Two clementines, for example, make up a portion, and so does a handful of grapes. A portion is roughly equivalent to 80g of fruit. Different types of fruit contain different amounts and combinations of fibre, vitamins, minerals and other nutrients. 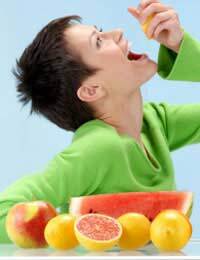 Eating a wide variety of fruit will therefore ensure that you get a good balance. Whether you enjoy fruit naturally, or are interested in eating a more varied, healthy diet, you should make fruit a regular feature in your diet. There are hundreds of varieties to try, and they are delicious fresh, dried, frozen or cooked in pies. You’ll soon notice the difference of eating your five a day.